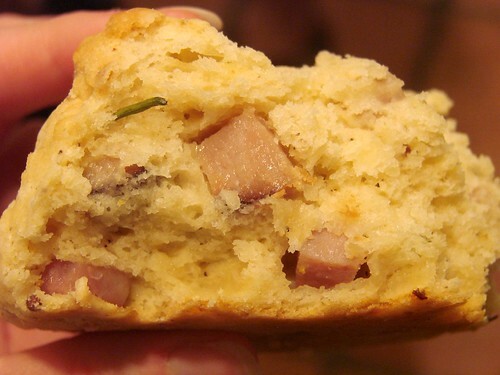 The Ham and Cheese Scone had cheddar baked into the batter and was studded with little pieces of ham and flecked with bits of chives. Delish. I've only ever had the scones solo or with butter, preserves and cream, but I'm definitely curious to try their Sconces Benedict: poached eggs atop a savory scone with rosemary hollandaise sauce & potato chicken hash. Next time! The Pumpkin Scone was nicely spiced and had a great caramelly glaze on top, something akin to sticky bun topping but without the nuts (heaven for this non-nut eater!). If you're taking your scones to go, be sure to ask for some jam and cream to go as well. Just right for a picnic in the park! Alice's ham & cheese scone is my favorite! I usually have one at the restaurant and one to go. SHUT UP. This has to be the place I miss most in NYC. 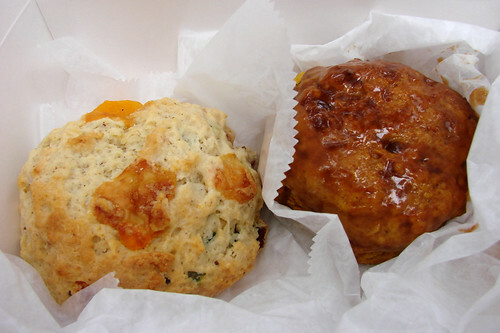 I think I actually got teary when I clicked over and saw a picture of that savory scone (I know, me! savory!). I love Alice's not only for their baked goods but for the interesting history it has too. The benedict I had never heard of though. Luckily I will be back in the city in October!!! The pumpkin ones are amazing!